The stylomandibular ligament is the second supporting ligament of temporomandibular joint, including sphenomandibular ligament. It originates from styloid process and goes inferior as well as anterior towards the angle and posterior margin of the ramus of the mandible. Stylomandibular ligament is a fibrous extension of the deep cervical fascia which spreads out towards the angle of the mandible via the tip of the styloid process of the temporal bone. The masseter and parotid gland laterally. 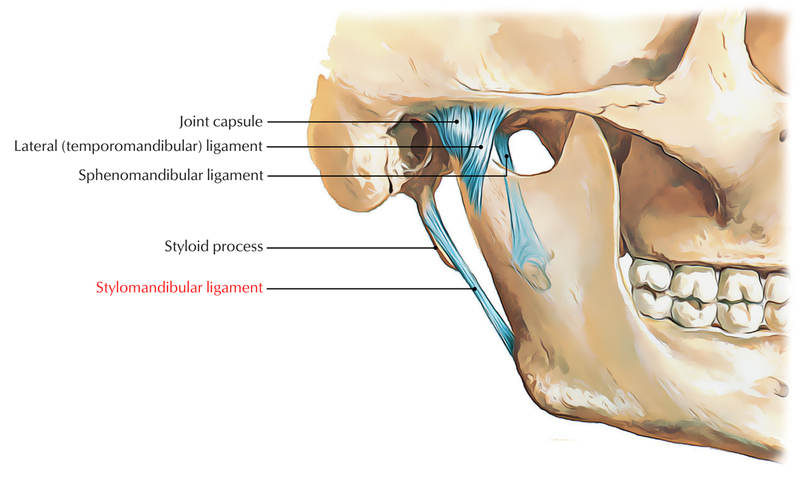 Stylomandibular ligament connects to the angle of the mandible. In order to create the stylomandibular ligament which divides the parotid gland and submandibular gland, a portion of deep layer of deep cervical fascia extends, ranging from styloid process till the angle of mandible. The stylomandibular ligament separates the digastric triangle into anterior and posterior parts. It gives origin to a few styloglossus fibres. Its main purpose is to inhibit excessive alteration of anterior movements of the temporomandibular joint. It becomes tight whenever the mandible is protuberant; however it is most unperturbed when the mandible is opened.